First of all, these covers are waterproof. The material is waterproof. The cover is made from marine grade polyester. The cover is made from 7.8 oz/600d/600 denier solution dyed polyester. 'Solution died' simply means that the thread is dyed before it is woven into the material, as opposed to the fabric being woven or produced, then dyed. This process allows for better penetration of the dye, and better colorfastness. This makes the cover very resistant to fading. The fabric is marine polyester that is treated and sealed in multiple ways. Specifically, it is double polyurethane coated on the bottom, or down side, as well as UV protected and mildew protected. Polyester has a very rich color and holds up to UV exposure very well. It also is very strong, resists stretching, retains it shape well. It has a very 'high end' look and feel, in addition to being quite heavy duty. The material is 600d. Most covers like this you will find are 300d or 150d, which are proportionally 1/2 and 1/4 as heavy and as heavy duty. It is hard to waterproof a zipper, and it is hard to waterproof seams. We have taken steps to address both of those issues, and the result is a fantastic product. In searching for a waterproof cover, do not forget the dangers of UV! UV causes substantially more damage to boats, including canoes and kayaks than water! Fading, cracking, sun damage, etc, can be greatly reduced by using one of our covers. 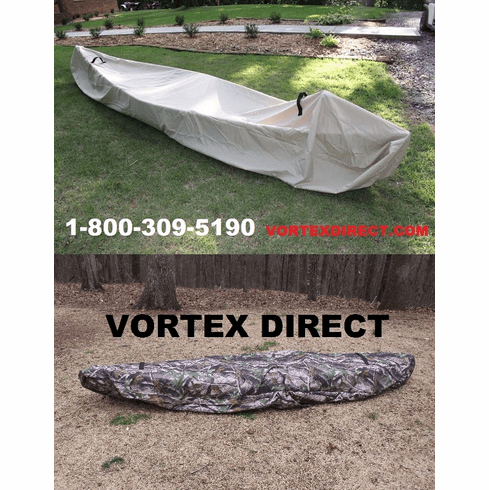 These Vortex WaterGuard canoe/kayak covers are also excellent for keeping your canoe/kayak clean. 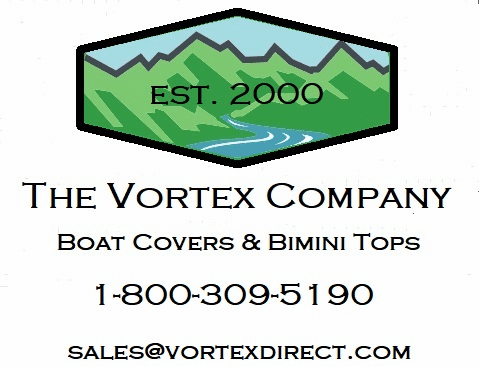 In addition to UV rays and water, Vortex WaterGuard canoe/kayak covers are good at keeping out bugs, leaves, spiders, limbs, etc. These have a zipper that runs roughly 1/2 way down one side, making it very easy to install and remove. These have a 'flap' over the zipper. This greatly adds to the waterproofing. Since the fabric is waterproof from the outside, yet lets water vapor out, you can even put your canoe/kayak in it with it still damp..no mildew to deal with. The water vapor will normally evaporate out through the fabric. Still, drain it if you can, before you put it in the cover. Don't let water accumulate on top of the cover...water is heavy and damaging. If your covered canoe or kayak is exposed to rain, use a simple support system to hold it up in the middle. Nothing complicated is needed..just something to 'tent' it or 'arch' it, so water can run off easily!! Sometimes nothing is needed, as some canoes or kayaks are shaped such that they have an unintentionally built in support system..
What really makes these worthwhile is that it takes a lot of the maintenance out of kayaking and canoeing. When spring rolls around and you can get out your canoe or kayak and pull it out of the cover and use it ..without having to dump wet leaves out of it, or water, or snow, etc..it is really nice...Or, in the summer, if you keep your kayak/canoe outside and do not have water in it..and mosquitos..and spiders....and ants....., it is also really really nice. We recommend these highly to anyone who has a canoe or kayak. We have several sizes (currently 10', 13', 16', and 18'). The 10' will fit up to a 8' girth, while the larger ones will fit up to 9 1/2 ft girth). By girth, we just mean the distance around the canoe/kayak in the middle. Just take a tape measure, wrap it around the canoe/kayak in the biggest part (most likely the middle), and that is the 'girth'. The size of this particular cover will be listed in the description at the top of the page. As always, call us with any questions or concerns!!! Shipping is free to anywhere in the contiguous United States. For shipping to anywhere else, please contact us. Please see pictures. WE ARE THE ONLY AUTHORIZED VORTEX MARINE DISTRIBUTOR ON EBAY. WE TAKE THIS VERY SERIOUSLY. WE WANT YOU TO BE 100 PERCENT SATISFIED WITH YOUR PURCHASE FROM US.